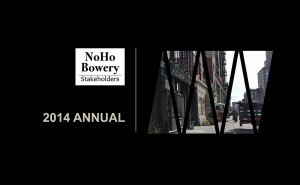 The NoHo-Bowery Stakeholders Annual Meeting on April 20th at the Aicon Gallery was well-attended by members and friends. As usual the conversations flowed freely at the NoHo-Bowery Stakeholders Annual Meeting and across the many topics our very active NoHo dwellers follow. Of course the exquisite culinary creations prepared by CuisinEtc were a major feature, as was the Aicon Gallery itself. After ballot proposals passed, a spontaneous and lively question and answer period ensued: What’s with the Mayor’s new Inclusionery Zoning Proposal; when can we get rid of those giant billboards; any news on the proposed new development with additional air rights at Bleecker and Mulberry; what’s with the staccato bike lane on Lafayette? Attendees encompassed the full spectrum of the membership from residents to institutions to hotels and restaurants to artists and designers, with a healthy mix of veteran and new neighbors in every category.